William Redwood was born in 1858 in Clayhidon, Devon, close to the Somerset border. He was the son of Cordwainer (shoe maker) John Redwood (1823-1894) and Alice née Moore (1828-1868). In the 1861 census John and Alice were listed at Floods Cottage, Clayhidon, with their children; Anna (b1852), Edwin Walter (b1854), Barnard (1856-1863) and 3-year old William. John and Alice were to have two more children; Elizabeth (b1862) and Mary (b1865), but sadly Alice died at Clayhidon in the spring of 1868, aged 40. In the 1871 census John and his surviving children (Barnard had died in 1863 at the age of eight) were living at the Tithe Barn, Clayhidon. All the children, from 19-year old Anna to 6-year old Mary were listed as scholars. 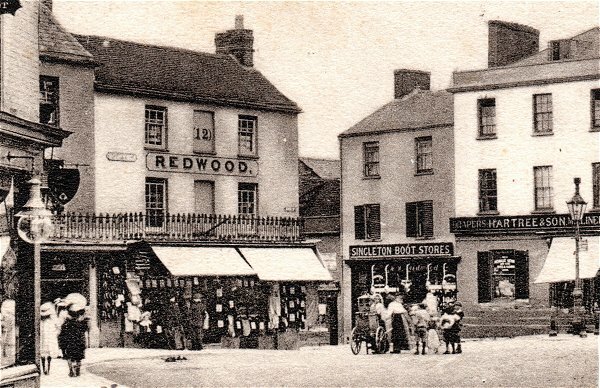 By 1881 John Redwood, together with Edwin, William and Elizabeth, had moved to West Street, Ilminster, where John and William gave their occupations as Bootmakers while 27-year old Edwin (who had severely damaged his hand in an accident several years previously) worked as a Boot Salesman in the shop. In the spring of 1884 William married Carrie Dummett (1863-1920) of Buckland St Mary, the daughter of farmer and butcher James Dummett (1820-1882) and Susannah née Coleman (1830-1901). William and Carrie were to have four children although only two survived childhood; Evelyn May, known as May (1885-1980) and William John Veron (1904-1986). William entered into a business partnership with his older brother Edwin during the 1880s, as outfitters specialising in footwear. Edwin lived in Bristol with his wife Anne, 12 years his senior, where he ran a house furnishing and general merchant's business. The brothers established a branch in Chard and, by 1888, a branch in Yeovil. In the 1891 census William and Carrie, together with May, a domestic servant and an Outfitter's Apprentice, were living above the shop premises at 12 High Street (in the Borough). 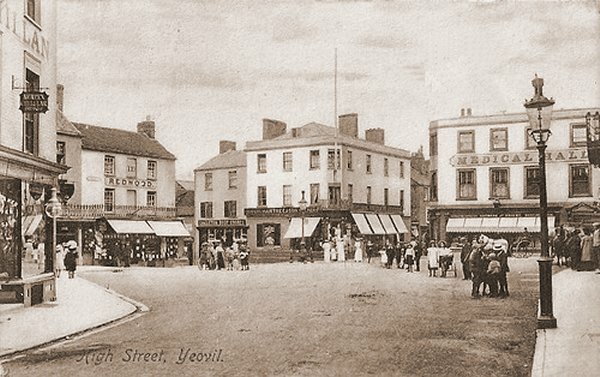 By 1900 the brothers had branches in Yeovil, Ilminster, Chard and Crewkerne. The business, known as 'Redwood Brothers', was advertised in Kelly's Directory of 1894 as "Clothiers of 12 High Street" and William was also listed separately in his role as an Auctioneer. The brothers' business was listed in the booklet 'Where to Buy' in 1895 as "Redwood Brothers, Clothiers, Hatters & Outfitters of 12 High Street" and in Whitby's Yeovil Almanack Advertiser between 1898 and 1903 as just Clothiers and Outfitters. 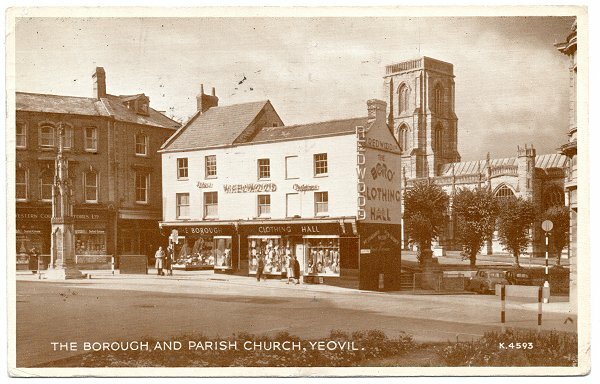 However, in 1902 the brothers had dissolved their partnership (see Gallery) and had gone their own separate commercial ways with, it appears, William retaining the Yeovil business. It is not known what happened to the Ilminster and Crewkerne branches of the business, but Chard came under the management of Edwin Redwood. Proprietor of the 'Golden Canister Supply Stores', 14, Middle Street. High Street and the 'Borough' is a large square in portion of which the butchers' shambles, etc., used to stand. Directly at the corner of Silver Street, as you enter the Borough from the Railway Station, you face the spacious and commodious premises of Messrs. Redwood Bros., tailors, hatters, and juvenile outfitters. A portion of the premises now occupied by this firm were originally used as a 'clink' or 'lock up', and underneath the shop is the place where the prisoners were retained. We have been told by some of the oldest inhabitants, that within their recollections, a prisoner, who had been confined in this place for some trivial misdemeanor, was, by mischance, completely forgotten by the worthy constables of those days, and allowed to starve to death [for the story click here]. 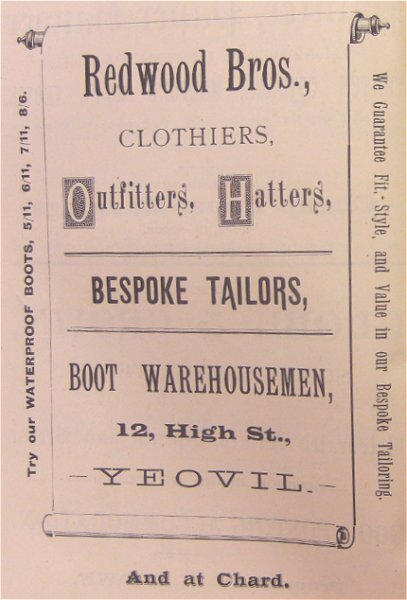 These premises are now occupied with ready made clothing, hats, caps, boots, shoes, &c, where a cutting, ready money trade has for some years been carried on by Messrs. Redwood Bros., who have gained the custom and confidence of large numbers of all classes in and around Yeovil, and you may frequently hear such an expression of opinion as this, especially among the young men "If you want a thoroughly good fit, and something worth your money, you must go to Redwood's." Their stock is exceptionally large and well assorted, their tailoring department is under the practical supervision of an experienced cutter, and to avoid 'old stock' the firm change their patterns twice a year. Mr W Redwood has the management of the Yeovil business, and pays personal attention to all customers and orders. The business in Fore Street, Chard, is similar to that at Yeovil, but is under the management of Mr E Redwood. The 1901 census listed William and Carrie together with daughter Evelyn May and Carrie's sister Eva living above Singleton's Boot Stores at 1 Silver Street. William gave his occupation as 'Boot & Outfitting Shopkeeper'. There were also a Boot Saleswoman, an apprentice and a domestic servant living above the premises. Singleton's had been founded by James Singleton in the 1840s and later run by his two daughters, the Misses Margaret Amelia and Martha Singleton, as a 'Boot Warehouse' but it became the footwear department of William's growing enterprise, certainly by 1901 when E & W Redwood were advertising their new stock in the local press (see Gallery below) and also advertising for boot repairers to work at 'Singleton Boot Stores'. William retained the name 'Singleton Boot Stores' at least until 1916. 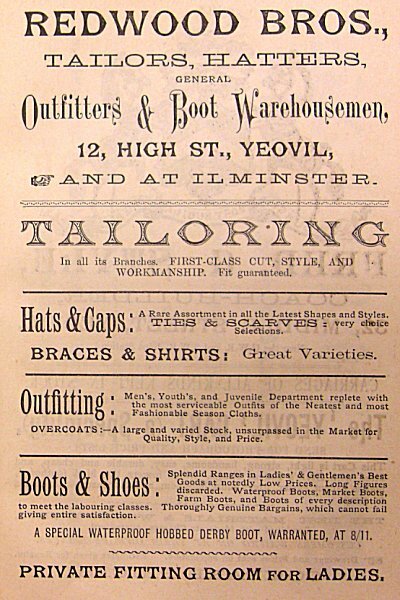 Collins' Yeovil Directory of 1907 listed "W Redwood, Outfitters, etc. of High Street" and in the 1911 census William, Carrie, William Jnr, Eva and a domestic servant were still living above the Silver Street premises. 52-year old William gave his occupation as 'Outfitter, Shopkeeper'. Kelly's Directory of 1919 listed "William Redwood, Tailor of 12 High Street". In the early 1930s William acquired what had been Hayne's butcher shop next to his premises in the Borough (Hayne's moved to the northern end of Princes Street where they remain today) and Kelly's 1935 Directory listed the business as "W Redwood Ltd., Tailors of 10a & 12 High Street". William Redwood died in Yeovil during the winter of 1951. He was aged 93. The final listing of his business, at this time being run by his son William John Veron, known as Vernon, was in Edwin Snell's Directory of 1954 in which it was listed as "V Redwood, Tailors of 11,12 High Street." However the business finally folded soon after the death of his father and all the houses were sold off. By the late 1950s Redwoods was no more and the premises in the Borough were occupied by Finlay's the tobacconists, coffee bar and record shop and the Silver Street footwear department was occupied by Chard's shoe shop. William J Veron Redwood died in Norwich in 1986. Many thanks to Patricia Ann Smith for the following - "Redwoods was a rather upmarket gentlemen's outfitters. The Redwoods were a local family and they owned a lot of properties in the town. They also had a shoe shop at the top of Silver Street and I used to go there after school (Reckleford Infants) sometimes as Dad worked there. I well remember the stacks of Clarks' shoe boxes, the smell of leather and the dark and dingy cellar where Dad occasionally carried out shoe repairs. Redwood's stocked good quality clothing before the war and once rationing was over everything no longer had to have the Utility Mark on it! After Mr Redwood died the shoe shop was taken over by Chards and the main outfitter's shop became Finlay's tobacconists, coffee bar and record shop. My father worked for Mr Redwood for a total of 26 years. Miss Redwood (we were never privy to her Christian name) lived in a large house called "Arbutus" at The Park, next door to the Park School where I understand she was probably a Governor or something similar. The house was named for the enormous arbutus tree in the front garden - I wonder if it's still there? I wonder if that whole road is still there? I remember taking a document to her when I worked at Marsh, Warry & Arrow, when she made me sit on a hard chair in the entrance hall while she went off to sign it. She seemed to be incredibly "posh" to little teenaged me!" 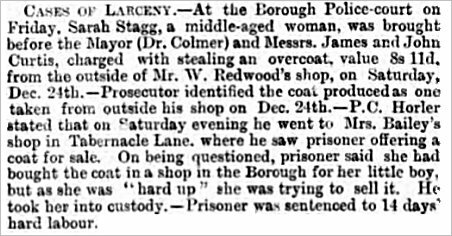 That William Redwood was in Yeovil by 1888 is evidenced by this report from the Bridport News' edition of 6 January 1888. .... and this advertisement placed in the 1888 edition of Whitby's Yeovil Almanack Advertiser. The Redwood Brothers' full-page advertisement in Whitby's Yeovil Almanack Advertiser of 1891. 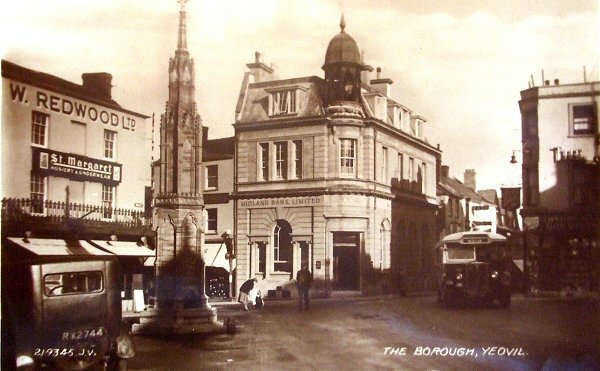 A photograph of the Borough by Jarratt Beckett and published in his 1897 book "Somerset viewed through a Camera". The Redwood brother's premises at 12 High Street are seen at extreme right, next to Hayne's the butcher. William would later occupy both premises. This notice, placed in the 12 April 1901 edition of the Western Gazette confirms that the Redwood brothers were using the former Singleton's Boot Depot by this date. In fact they kept the name of Singleton's for many years on the premises. 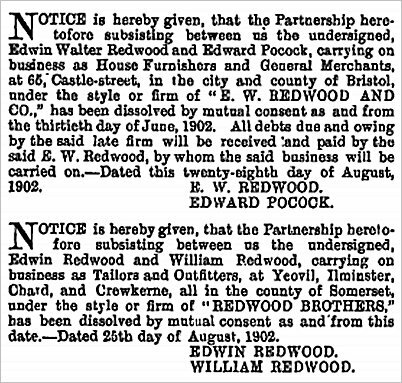 Notices placed in the London Times in August 1902 in which Edwin dissolved his partnerships, including that with his brother William. The Borough seen in a postcard dated 1908. At the centre is London House with Silver Street to its left and Middle Street to its right. At right is the Medical Hall with Wine Street off to is right. 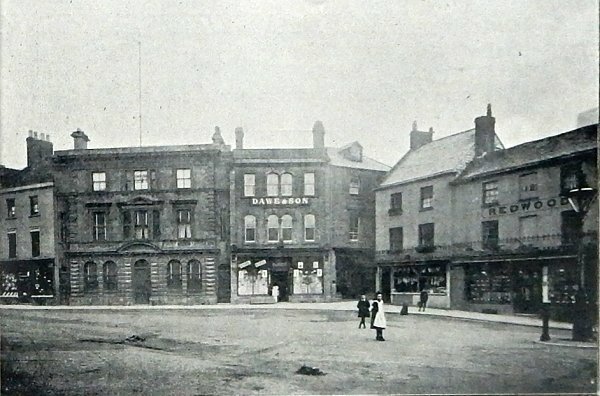 A section of the above 1906 postcard enlarged to show William Redwood's premises left of centre. By the time of this photograph Singleton's Boot Stores right of centre had been acquired by William as a second outlet specialising in footwear (he retained the name of Singleton's Boot Stores for a number of years) and he and his family lived above the ex-Singleton premises, certainly from 1901. 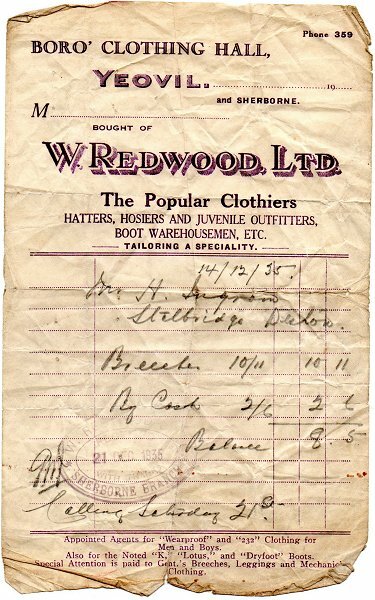 A Redwood's receipt, in a somewhat tired condition, from December 1935. Looking east across the Borough, circa 1940. Hayne the butcher left his Borough premises in the 1930s (to move to the northern end of Princes Street where it remains today) and it was acquired by Redwood's. 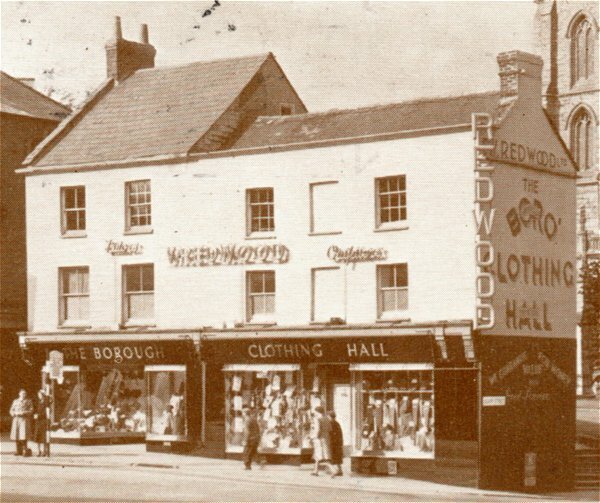 From this time Redwood's had three shops; two in the Borough (at left) and the footwear department in Silver Street next to the bank. At this time each of his three premises still had a pitched roof (but none do today). 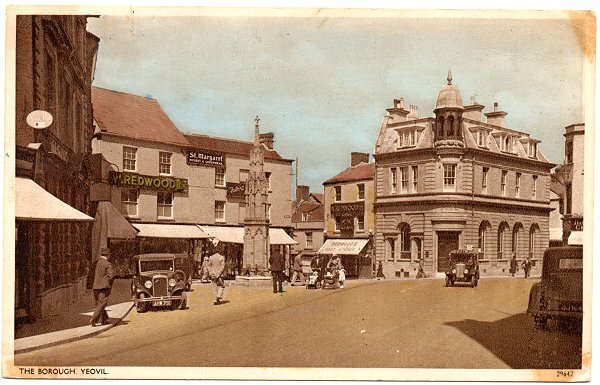 A postcard (the photograph was taken in 1952) of Redwood's "Borough Clothing Hall". An enlargement of the previous image.